Welcome to the reviews of the best surfboard wall racks, mounts, stands and displays. A wall rack will stop your surfboard from falling over and getting dinged and damaged and it’ll save you room space as well. What’s more, they simply look better when mounted on a wall properly! Check out our guide below on how to choose the best one for your home. What to look for in a surfboard wall rack? Strength – Check the carrying weight of your surfboard storage rack to see if it is strong enough to take the weight of your board. Some sup surfboards may be too big and heavy for the mount. Where you’ll hang your board – Before buying, get a tape measure and within your room or garage find the location that you want to mount your board. Measure this out with a tape to check that you have enough room to match the size of your surfboard. Building material – Typically, surfboard racks are made from wood, aluminium, steel or plastic. Metal and wooden racks tend to be on the stronger side compared to plastic ones. How many surfboards you need to store – Instead of buying a single wall rack, go for a multi-carrier option if you have a number of surfboards. Also, adjustable surfboard racks are available which make storing multiple boards of different sizes much easier. Padding – Some racks come with padding to protect the edge of the boards from dings whereas others don’t and so you need to be more careful when placing your board. Rack pads can provide soft protection if needed. Style & design – A personal preference, but you want a mount that matches that style of you room. Also, the double check that the size of the holds are big enough to accommodate the width of your board. How easy it is to setup – Each wall rack will come with it’s own instructions but you’ll normally need a drill and screwdriver to finish the installation. 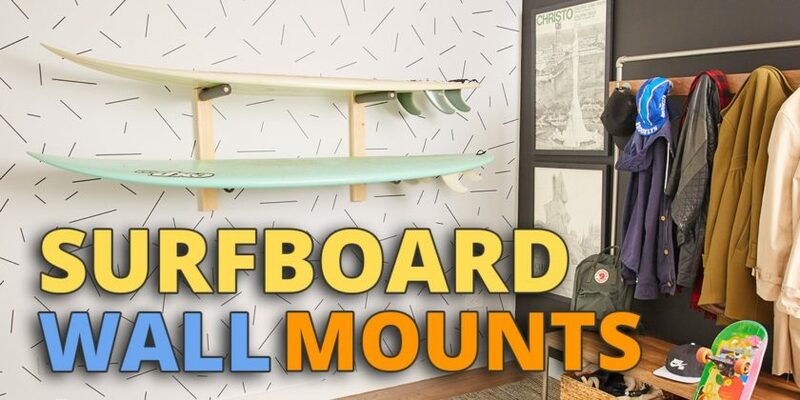 Pricing – As an accessory item, surfboard wall mounts generally go for $20 to $50 – although some of the higher end, larger and multi-storage options can easily hit the $100 mark. Aesthetically looks good as it is made from dark stained wood. One of the most popular surfboard wall racks that is sold. Created using sustainable and eco-friendly materials. Free replacements if the wood is damaged and a money back guarantee. Some users have complained about the quality of the materials and the finish applied to the mount. There’s a reason why this is one of the best selling surfboard racks in the world. The dark wood looks great and is sourced as an eco-friendly product. Plus if there are any issues, the guarantee and free replacements will cover you. Made from aluminium which is strong and never rusts. Simple, minimalist and does exactly what’s required. Whilst minimalist, this surfboard stand is still slightly visible so if this is an issue then choose a clear acrylic mount. A wall rack that is hardly visible at all! Great if you’re looking for a minimalist design. Can hold up to 4 different surfboards. Well padded arms stop any resting dents from happening. Could be used vertically also if resting on the floor. The rods come with some flexibility when your board rests on them. Height isn’t adjustable as with other multi-storage wall mounts (see the product listed below). Loses half a point for not being adjustable but otherwise the choice to go for if you need a horizontal, multi-storage surfboard wall rack. Holds for 4 different surfboards. Holds can be adjusted, removed and replaced up and down the length of the rack allowing you to accommodate different sized boards. Each hold is shaped at a different angle to maximize space and prevent boards from hitting one another. Made from heavy duty metal arms with padded tops. Some user’s have reported minor issues with attaching the arms onto the rack – although this is usually sorted with a tap of the hammer. This is the best multi-storage AND adjustable wall rack available. Great if you have surfboards of varying sizes. Holds over x6 surfboards – much more than most racks available. Made from strong quality aluminium combined with soft foam padding. You get a 100% lifetime guarantee. Can hold heavier weighted boards since the surfboards rest on the floor. The bottom of the board rests on the floor so if not on a concrete floor then you may also need surfboard mat or material to soak up the water droplets. Takes up floor space as the bottom of the boards rest on the floor. This surfboard storage rack has raving reviews. Whilst you lose floor space as the bottom of the surfboards hits the floor, you make up for it with the extra surfboard holds (up to 6!) and the ability for this rack to take heavier weights with its freestanding design. Extra heavy duty steel holds that are strong enough to carry up to 200lbs which covers the weight of most paddleboards. Extra wide holds provide plenty of space for a SUP board. Some user’s have reported issues with the screws provided and so you may want to use your own. Choose this if you need an extra strong surfboard rack as it is big enough to take paddleboards. From Hi-Line, this is a type of surfboard ceiling rack which is created by hanging an adjustable surfboard strap to your ceiling. It allows you to hang up to 50lbs of surfboards and provides you with extra floor and wall space. A unique concept whereby you hang your surfboard upon a horizontal pole by hooking the board into one of it’s fin boxes. Works with FCS and Futures fin boxes but not FCS2 fin boxes. Effective way of saving space if you’re looking to hang your shortboards in a closet. A good option if you want a transparent surfboard wall mount that is hardly visible at all. Made from a transparent acrylic material, you’ll hardly notice the wall mounts are even there. Surfboard mats are handy for resting your surfboard on while they dry – especially useful if you have carpets instead of hard floors which is what the ShredPad is used for. Wetsuit changing mats/changing bags also come in handy if you don’t want to spread a load of water around your home after a surf session. They’ll protect your cars from getting wet and they making carrying the wetsuit easier as well. The SBS Suit Saver is one of the most popular and affordable wetsuit bags available.